The Australia Competition & Consumer Commission (ACCC) today announced that Telstra has been fined AUD$102,000 for a misleading iPhone 6 advertisement. 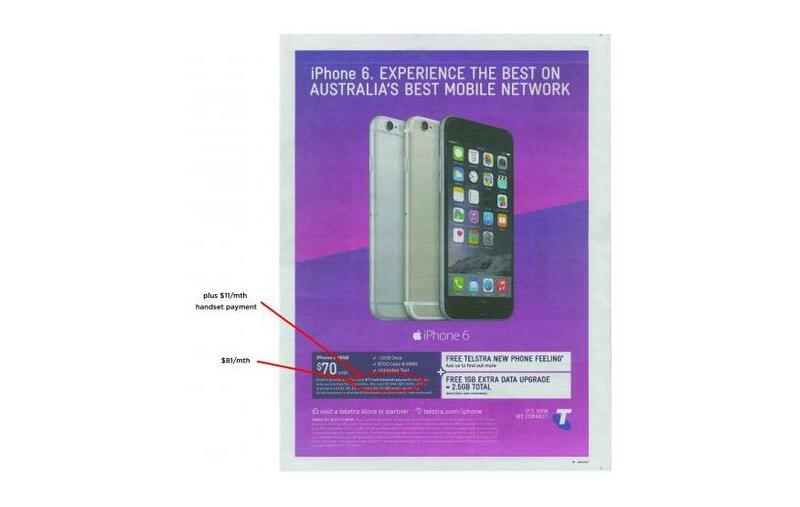 The A3 advertisement, promoting the newly released iPhone 6, appeared in Melbourne newspaper The Age on September 27 and prominently displayed a cost of AUD$70 per month. This cost referred to plan's pricing, but omitted the AUD$11 per month handset cost associated with the iPhone 6. This handset fee and the total monthly cost of AUD$81 were only disclosed in the fine print. The ACCC believes that Telstra's advertisement misrepresented the price of the phone and phone plan bundle to consumers, contravening Australian Consumer Law. “Consumers should be able to understand the true cost of an advertised product so they can make informed purchasing decisions,” said ACCC Chairman Rod Sims.